Introduction It is known malignant cells, cancerous tissues and microbes are heat sensitive and that under certain conditions they can be selectively destroyed by heat. Systemic whole body hyperthermia (SWBH) heats the whole body to a temperature of 41.6°C (106°F) and above. SWBH is used principally in advanced stages of cancer and is also used as a metastatic prophylaxis in high risk patients, e.g., young premenopausal women with breast cancer, lymph node involvement and negative hormone receptor status. SWBH also enhances the effects of an adjuvant chemotherapy or radiation treatment and has been found extremely useful in the treatment of Lyme Disease. SWBH can not be compared to the ‘fever therapy’, which is used in Natural medicine. During ‘fever therapy’ bacterial lysates are injected, which then induce the release of cytokines, which then brings about a fever reaction. This fever only reaches a maximum of 39°C (102°F), which is not sufficient to induce enough thermal damage within the cancerous tissue. It must however be stated that the immunological effect of this treatment can improve the general condition of the patient, resulting in a positive response. Systemic whole body hyperthermia: heats the entire body to a core temperature of 41.6°C (106°F) using specially developed device. Whole body Sedation required. 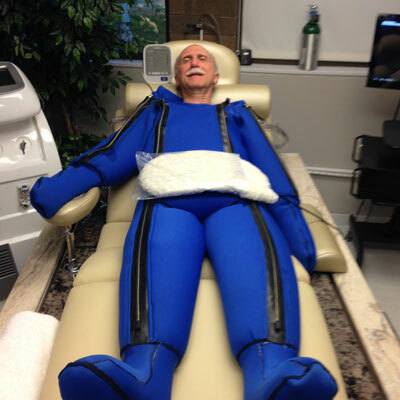 How and why does whole body hyperthermia work for Lyme disease? From my understanding and research there are two main reasons why hyperthermia works well for Lyme disease (and of course cancer). The obvious reason is that a whole body fever is beneficial in killing bacteria – in this case borrelia and co-infections (especially those that are bacterial). It is a know fact that borrelia bacteria die at 105 degrees Fahrenheit (40.5556 degrees Celsius) so to get maximum results the body’s core temperature must ideally reach this heat or above.At Life Health Reasearch Centers in Bountiful, Utah it is used extensive hyperthermia which is 104-106+ degrees Fahrenheit (40.5°C-41.5°C degrees Celsius). Patients are only at the top heat for about 10-20 minutes at most so thats why its important to go above 105 degrees Fahrenheit so a significant amount of the treatment your body is hot enough to kill the borrelia, its co-infections and release the cysts. As the borrelia and other micro-organisms flee the heat the antibiotics in the blood stream assist in the destruction of the microbes. The TREATMENT IS EVERYDAY FOR 2 WEEKS. There is no other center that provides such a strong and comprehensive treatment.The most effective part of the whole body hyperthermia is the way it supercharges the antibiotics. Before you have your hyperthermia you will have enzyme exercise, medical smoothie with the necessary nutrients that your body will need, plus through out the process you will have hyper-oxygenation treatment. If necessary we will provide IV with antibiotics. You will be hooked up to monitoring equipment and a sedative administered through your temporary drip (you will also be hooked up to an antibiotic drip simultaneously). As your body temperature rises it looks for glucose to feed the cells and the brain but instead all it can find is the antibiotics so it draws the antibiotics into the cells, tissues and across barriers that antibiotics would not usually be able to penetrate. Is whole body hyperthermia safe? Before any patient is accepted for systemic whole body hyperthermia, physical examination controls are carried out. Since no sedation is required and tempeatures are only between 40.5°C-41.5°C (104°F-106°F) (no sedation required) the risk is limited and controled. The patient’ s head (outside the unit) is cooled. In addition to the thermal damage and PH-shift, the increased heat has been shown to enhance the effect of the drugs chemo drugs for cancer patients and IV antibiotics for Lyme patients without having to use high dosages. Thus the strong and often toxic side effects of these drugs can be overcome (when compared to regular chemotherapy treatment and long term antibiotic use in chronically ill Lyme disease patients) using SWBH.